Our Next Gen Modular 25,000 TEU ULCS - Ultra Large Container and Bulk Carrier Ships take advantage of BENTLEY MARINE's exclusive much wider and stable Triple Inverted Bow Design with SWATH Monohull with Outriggers Technology. Inverted bows maximize the length of waterline and hence the hull speed, and have much better hydrodynamic drag than ordinary bows, dramatically increasing the ship's fuel efficiency. The innovative ship features GREEN LNG Dual-Fuel Hybrid-Electric Propulsion for superior performance and unparalleled fuel efficiency and reliability. By running on clean LNG fuel, in addition to reducing NOx, SOx, and PM emissions, BENTLEY MARINE's Next Gen Container & bulk Ships also meet and exceed Phase 3 of the Energy Efficient Design Index (EEDI) defined by the International Maritime Organization (IMO) for ship GHG emissions. Capable of up to 40 knots sustained speeds and unparalleled seakeeping and deck space in comparison to all other ULCV -Ultra Large Container Vessels. BENTLEY MARINE's innovative Triple Inverted Bow multi-hull form allows this new generation of Fast ULCS Container & Ultra Large Bulk Ships to maintain heading and higher speeds in very rough seas without dropping any container boxes overboard, as seen even in the newest 20,000 TEU ships, or break in two and sink as witnessed in many recent accidents with conventional VLOC - Very Large Ore Carriers monohull ships do. BENTLEY MARINE's extra-wide SWATH monohull with outriggers hull provide more deck space for the same length with unmatched stability in any weather and sea conditions at twice the operating speeds of conventional container ships. Unlike the newest 22,000 TEU ULCVs, that stack the containers deep into the ship's hull with no way to extinguish a fire, BENTLEY MARINE's advanced NEXT Gen ULCVs are the world's first true Fire-Proof Container Ships, with fully isolated bulkhead compartments that are electronically monitored with afire alarm and smoke systems that can be flooded in minutes extinguishing any fire deep into the ship's hull. BENTLEY MARINE's Next Gen exclusive ultra-compact LNG Turbine Hybrid-Electric propulsion with CHPC-Combined Heat, Power & Cooling turbine generators save up to 50% space in comparison to standard ship engines and complement the GREEN IMO 2020 compliant package, providing clean electricity, hot water and air conditioning for the entire vessel. By running on LNG, in addition to reducing NOx, SOx, and PM emissions, BENTLEY MARINE's Next Gen Container & bulk Ships also meet and exceed Phase 3 of the Energy Efficient Design Index (EEDI) defined by the International Maritime Organization (IMO) for ship GHG emissions..
BENTLEY MARINE's revolutionary Autonomous Submersible Container and Bulk Ships are less expensive to build, more fuel efficient and much safer than conventional ships because they are completely immune to rough weather and ship piracy, as they travel under the water surface. In addition to safe and clean military-proven and IMO compliant Nuclear Propulsion that needs refueling only every 25 years, thus lasting the lifecycle of the ship, BENTLEY MARINE's Next Gen Submersible cargo ships can also be alternatively LNG-Powered with Hybrid-Electric Fuel Cell Propulsion. 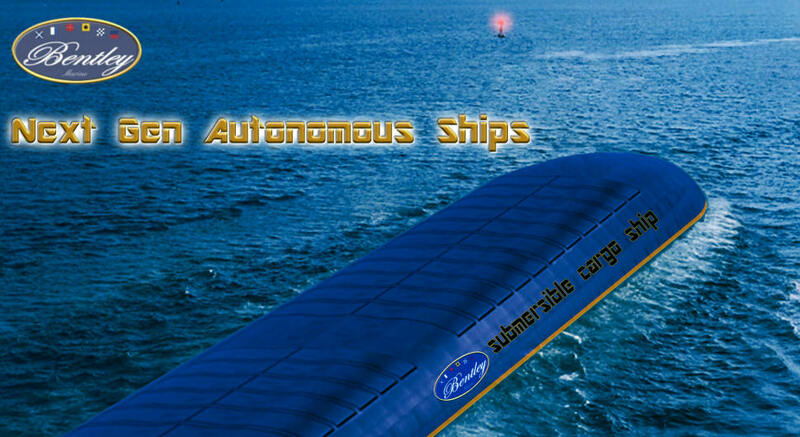 The Future has arrived and it will be soon coming to a Port near you! All Services, Products and Designs are Copyrighted and Trademarks of John F. Rodrigues. All technical data and information supplied in this site is subject to change without notice. Reproduction of any names, contents or images from this Site is a Crime punishable to the maximum extent of Law. Some of the logos and pictures used in this site are Copyright and Trademarks of their respective listed companies and individuals.